Among last year's crop of animated movies was Disney's Wreck-It Ralph, a video game-focused animated adventure with a great story and the added appeal of various nostalgic arcade and video game references for those of us with a fondness for the classics. Disney has the DVD and Blu-ray set to arrive this March, and for the first time, they're offering an early release of the HD Digital and HD Digital 3D, which arrive February 12, 2013. 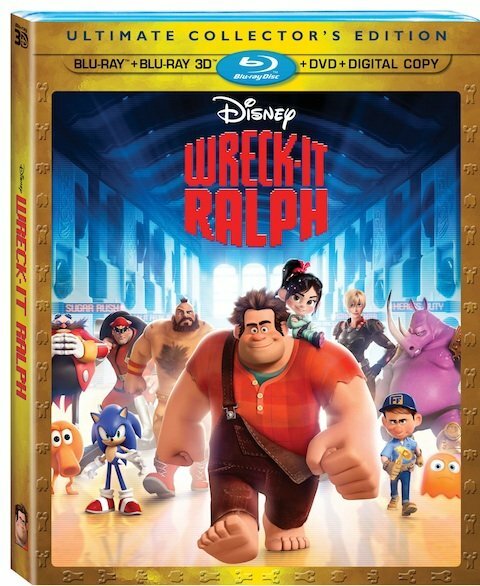 Wreck It Ralph features the voices of John C. Reilly, Sarah Silverman, Jack McBrayer and Jane Lynch, and follows Ralph, the bad guy featured in the fictional video game Fix-It Felix. Feeling under appreciated and tired of trashing the same apartment building day in and day out (and getting no love from the residents for giving their hero something to fix), Ralph sets out to change his fate and prove himself worthy of a medal by doing a bit of game-jumping. Of course, proving himself hero-worthy turns out to be about more than just obtaining a shiny medal. And therein lies the heart of the story. Disney released the details about the Blu-Ray/DVD set, which arrives March 5, 2013, following the early digital release set for February 12, 2013. Here's the box art for the pricy Ultimate Collector's Edition, which includes the Blu-ray, Blu-ray 3D, DVD and digital copy and retails at a hefty $49.99. As for the bonus material, expect alternate and deleted scenes, video game commercials, a look at the five new worlds created for the movie, and the excellent Paperman short that played in theaters before that movie. Directed by John Kahrs, the black and white animated short, which follows a man's attempt to get the attention of a pretty woman he sees on a train platform, is fantastic and definitely adds even more to the appeal of the Wreck-It Ralph DVD/Blu-ray sets. ?Bit by Bit: Creating the Worlds of “Wreck-It Ralph” – Fans of the film will get a look at five new worlds created for “Wreck-It Ralph.” The short takes viewers into Game Central Station with the artists who brought Sugar Rush, Hero’s Duty and Fix It Felix Jr. to life. ?Disney Intermission: The Gamer’s Guide to “Wreck-It-Ralph” – When the film is paused, host Chris Hardwick appears on screen to guide viewers through a series of 10 video segments offering an inside look at the many video game references, Disney references and other hidden surprises featured in the film. Those looking to pre-order can get the 4-disc set at Amazon (currently priced at $39.99) here. And the 2-disc DVD/Blu-ray combo pack ($31.99) here.